Great news! We now have access to a low level therapy laser. Therapeutic lasers have a number of benefits and no known side effects. 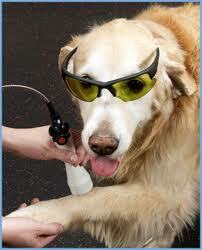 Laser therapy is frequently administered in a series of short treatments 2 to 4 times a week. More is not better, as more intense treatments can decrease healing. 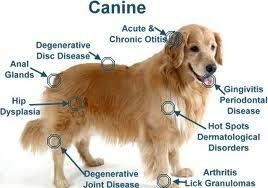 Sometimes, dogs or cats can feel tired or even a touch painful the day after a treatment. This is normal, not a sign of an overdose. 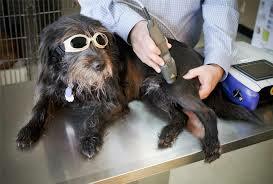 Laser Therapy has been used successfully by veterinarians for a number of conditions, including chronic degenerative joint and disc disease, wounds, tendon and muscle injuries, inflammation and edema from blunt trauma, and is known to stimulate immunity by activating lymphocytes and other cells. In short, low level lasers have added another option to our arsenal of treatments, and their judicious use has enhanced the quality of medicine we are able to offer to many of our patients.